The payoff for this unsettled weather comes later in the week, with a big warmup on the way for the Garden State. A coastal storm system will be the culprit for a period of driving rain — one more round of active, wet weather before some big improvements for the second half of the week. Radar is already showing a few bands of rain early Tuesday morning. Some of that rain is pretty heavy, but scattered. So through the morning commute, a given location may experience rain at a solid clip for 15 to 30 minutes, and then nothing. As the center of this storm system slides up the Atlantic coast, closer to New Jersey, the intensity and impacts of this rainfall will increase. 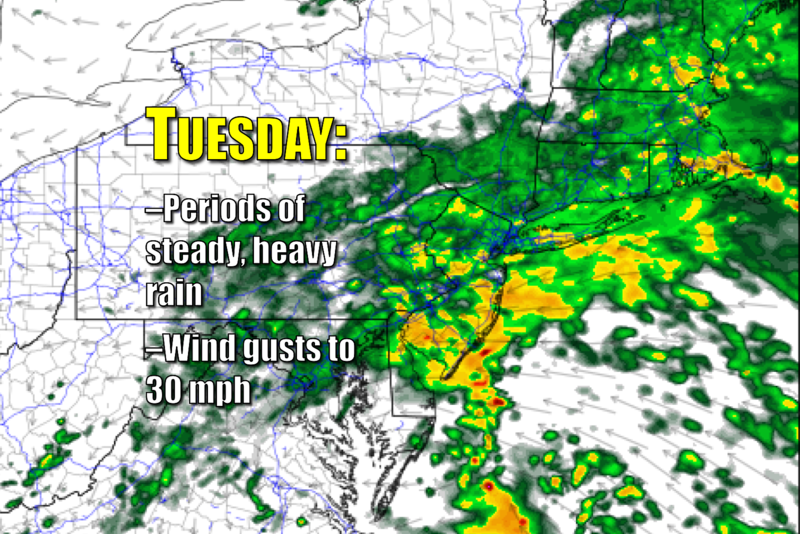 Steady rain will spread from south to north across New Jersey between about 8 a.m. to 1 p.m. The rain will become heavy at times through Tuesday afternoon, probably impacting the evening rush hour too. The heaviest rain is expected to fall along the coast. Rainfall totals should reach at least a half-inch across the state, with over two inches possible where it really downpours. A few rumbles of thunder will be possible Thursday too. Meanwhile, the wind will pick up alongside the rain, with gusts to about 30 mph. Some forecasters are calling for much higher winds blowing across the entire state, but I just don't see it. Temperatures will be held at bay thanks to the rain and clouds and wind. Highs are forecast to only reach the mid to upper 50s, upwards of 10 degrees below normal for late April. One more thing to watch... This strong storm system and its associated winds are expected to stir up the ocean quite a bit. A Coastal Flood Advisory has been issued for the entire Jersey Shore (from Middlesex to Salem county). Minor flooding of tidal waterways is expected during Tuesday evening's high tide cycle. It's not a warning, and major flooding is not expected. Just slightly higher water levels — something to keep in mind. By Tuesday night, rain will taper off to showers and winds will start to calm. As overcast skies continue, temperatures will only fall a couple degrees overnight, holding in the 50s through Wednesday morning. As this storm system kicks eastward and out-to-sea on Wednesday, we'll see showers come to an end. There's still disagreement among the major models regarding the end time of the rain — NAM saying we're drying before daybreak, and the GFS keeps raindrops over New Jersey through just after sunrise. In any case, Wednesday will be a much drier day than Tuesday. Humidity levels don't really lower by Wednesday afternoon, so I think skies will remain mostly cloudy all day. As the rain exits, we will start to warmup, with high temperatures peaking in the upper 60s to (maybe) lower 70s). Friday's forecast features a weak front that won't do much to our weather. Kick up winds a bit, and possibly pop up a shower or isolated thunderstorm. High temperatures on Friday afternoon will climb to around 80 degrees away from the ocean. It now appears Saturday will be the warmest day of this stretch as thermometers soar to the 80s across almost the entire state. Current model data suggests we could even hit 86 or 87 degrees in South Jersey. It's going to be pretty humid too — truly, a taste of summer! Clouds increase on Sunday and winds shift slightly, keeping temps a few degrees cooler in the upper 70s to lower 80s. I could see an isolated shower or thunderstorm popping up in this warm, humid, and increasingly unsettled atmosphere. Changes come on Monday, as a cold front delivers a round of potentially strong thunderstorms ahead of cooler air. Highs on Monday should still reach the above-normal 70s, but Tuesday will be more seasonable for early May, in the 60s.